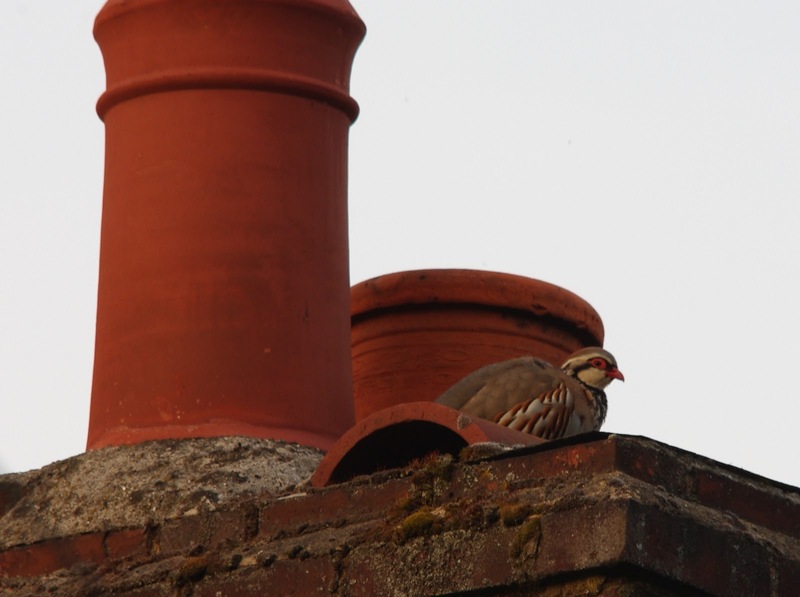 Sitting in the garden this evening around 9pm, contemplating the demise of english football as the sun hung low in the west and sent it’s golden rays down the valley, a partridge landed on my chimney stack. It took a second look to be sure it was and not a wood pigeon, but sure enough, when I put my lens on it a red-legged partridge came into focus. Now, I don’t know if this is a regular roost or a one-off, but I popped out later when the light had gone from the day and it was still there. Just hope it doesn’t get a surprise in the night from one of the local tawny owls. How very cool – I'm afraid I associate partridges with pear trees – they're almost mythic in my imagination. I certainly don't think of them as sitting about on cars and roofs! And the chimney is rather delightful, too. Well, who would have thought it – the partridge is back again tonight!